Note: I have no idea what is up with the font on this post. The size is all over the map with no rhyme or reason. It looks fine until it is published. As I mentioned yesterday, when I took the BoggsMobile to Vonore, Tennessee, there was one main reason for doing so. We were determined to get the AquaHot system replaced and be finished with the whole thing. Even though it did not work out as hoped, Jeff worked diligently and he will get it eventually. It really was a great visit. Jeff also fixed a bunch of things that you can not see. Air leaks are a constant battle on a coach like ours and Jeff took care of some of that on this trip. He replaced a few air fittings and one of the ride height valves and generally looked things over and tuned things up. ANY time Jeff lifts the BoggsMobile in the air, he examines the underside of the chassis carefully and that attention to detail caught what could have been a major failure! I have six tires on the BoggsMobile that were replaced 9 months before I arrived in Vonore. They are in great shape. This is one of them. That is great looking tread with years and years and miles and miles of service left on it. Except for this broken clevis sticking in the tread! Ouch! That clevis had broken off of the lift chamber assembly for the tag axle and some how ended up in the tire. The tire still had air in it so it probably happened on my way from London, Kentucky to Vonore that night. If that had happened out on the road in the middle of a long trip, it could have had catastrophic consequences. I hated replacing a tire with lots of life left in it but the alternative option would not have been pretty. Do you understand part of the reason why I thank God for Jeff Rowe every day? Another item on the agenda was repairing a boo-boo that I have not mentioned here on the blog. Late last year I was doing something that I try to never do when driving the BoggsMobile. I was in a hurry. I know better than to let anything rush me when driving something this big. I learned that when pulling fifth wheels many year ago and I have carried that over to the bus. Do not rush. Do not allow beeping horns, impatient drivers or time constraints cause you to drive this thing in a hurry. You will live to regret it. I violated my own rule late in 2016 and I paid the price for it. I had traffic waiting on me to get out of the way and I allowed the pressure to push me without carefully considering my options. It was no one's fault but mine when I swung the bus around into a wooden pole while backing into a place. 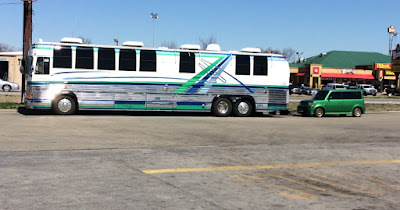 Prevost would have replaced the door at a tremendous, unbelievable cost but Jeff knew the bottom part of the frame could be replaced along with the bottom piece of stainless. It went from this.. The stainless along the bottom has a strip of green paint and a strip of blue paint. They will have to be added later on the new piece. Here is a picture of how the paint looks on the rest of the doors. I had some stainless rub rails that were loose in three other positions. There were two on the driver's side in addition to the door with the boo-boo. There was another on the passenger side. Since they were loose, I removed them and prepared the brackets to reinstall them. Only when I had them removed and prepared, did I realize I had the wrong adhesive. Jeff put those on while he was at it. Here are pictures of the driver's side with the rub rails replaced. It sure looks a whole lot better with all of the teeth replaced! 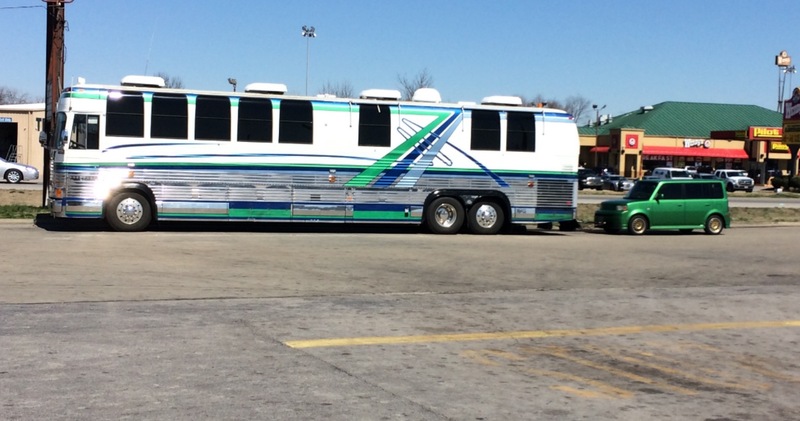 That wraps up our latest visit to East Tennessee Luxury Coach. I eNjoYED tHe poST toDAY. Even I don't know the answer to that question. Take care.